Any zoo in a world, regardless of its size and the number of animals, is among the top tourist sites. Belgrade Zoo is no exception. To everyone who is looking forward to spending a day with a family, and especially with the youngest ones, zoo comes to mind as a perfect destination. Most of us tend to stop by the zoo a few times a year and check out on lions, camels, hyppos and other more or less exotic animals. Belgrade Zoo, or commonly referred to as Beo Zoo, was opened long time ago in 1936 and soon became a favourite place to visit by many Belgrade residents, including the members of the Royal family. The newly-opened zoo stretched across 3.5ha and soon expanded to over 14ha, only before the war broke out. Unfortunately, due to widespread demolition that Belgrade was exposed to at the time, the area of the zoo was limited to around 7ha, as it is now the case. One of the advantages of this Garden of good hope, as it’s often referred to, is its location. A light stroll along the downtown streets and the Kalemegdan fortress, and you may easily find yourself right in front of Belgrade Zoo. Belgrade Zoo occupies the area in the very centre of Belgrade, the part also known as Mali Kalemegdan, as it belongs to this most prominent Belgrade park and fortress. Beo Zoo will enable you to see white lions and tigers, giraffes, zebras and antilopes, hyppos and seals, reptiles, bears, wolves, apes, elephant and vast variety of birds. A total number of animals living in the zoo is around 1,800 from 200 different species. 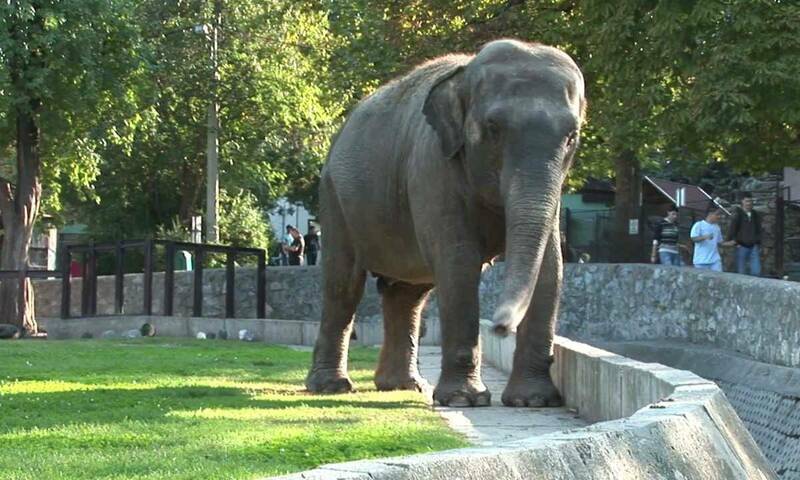 What Belgrade Zoo is most proud of is its most well-known residents, the heroes of Belgrade Zoo – Gabi, Sami and Muja. Gabi was a female German shepherd who in a heroic adventure saved the life of a guard from the assault of a runaway jaguar. Sami was a sturdy, handsome and stubborn male chimpanzee, famous for his restless behaviour. On several occasions, he would demolish the cage bars and go outside, wandering the streets of Belgrade, which was the situation also covered by news reports around the world. Both Gabi and Sami passed away long ago, but the memory of them remains and in the Zoo you can find sculptures in honour of these fantastic animals. Muja is still alive and is believed to be the oldest aligator in the world. At the same time, Muja is also the oldest resident of Beo Zoo, as he arrived in Belgrade a year after its opening in 1937. He is also the only animal to survive the WWII and all bombing that Belgrade faced in the 20th century. Visitors to the Zoo will probably be excited to find a new area being opened, the Zoo Garden for Kids, the area of around 1000m2 where the youngest visitors can use the playground area or the adventure park, and also fondle the baby goats, alpacas, ponies and be in direct contact with animals. It was announced that in this specially designated area for kids, which should promote healthy living and enjoying the nature, as particularly important for the kids, the zoo will provide the rest and relaxation area for the visitors, a shop and a cafe bar. If you’re planning to visit our capital, we from Novi apartmani suggest that you also stop by Belgrade Zoo. It might not be the most spacious one and might not have all the animals in the world, but it is surrounded by ancient fortress and it is hidden in one of the most beloved and central Belgrade locations. So, definitely, you should feel the charm of this place. That’s why, before you pack your bags and set out, do check out our web site and in the section STRICT CENTRE find an apartment which would suit you the most. There’s indeed a lot to choose from!